The channel docker allows you to turn on and off the channels associated with the color space that you are using. Each channel has an enabled and disabled checkbox. You cannot edit individual layer channels from this docker. If you want to edit individual channels by their grayscale component, you will need to manually separate a layer. This can be done with a series of commands with the layer docker. Select the layer you want to break apart. Make sure the Alpha layer is at the bottom of the group. Enable Inherit Alpha for the Red, Green, and Blue layers. 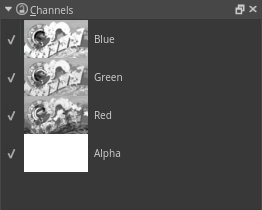 When working with editing channels, it can be easier to use the Isolate Layer feature to only see the channel. Right-click on the layer to find Isolate Layer.